“I love you.” Sometimes saying these three little words is the best way to express our love to our children. They certainly need to hear it, as do all those we love. Though I say them often to my children, however, sometimes my negative actions can speak louder than my words. I can be quick to judge the intention of their hearts, slow to listen, and slow to forgive an offense. 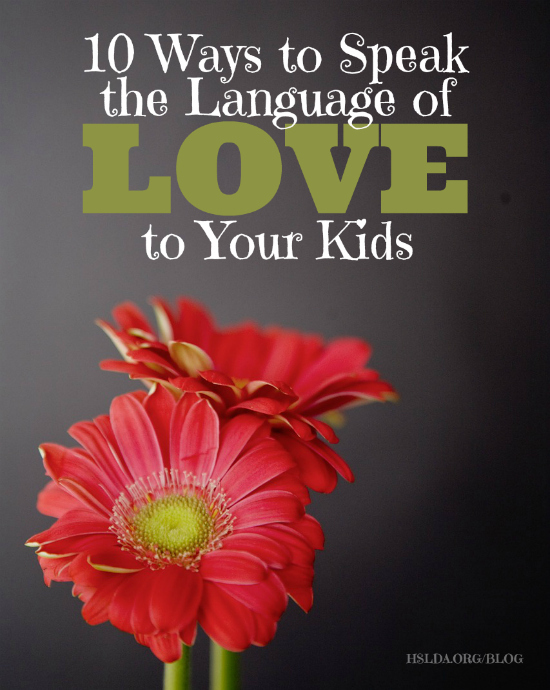 More than just saying “I love you,” what are some ways we can SHOW our kids we love them? Intercede for them – I have found praying for my kids not only brings the love and power of God into the picture, it knits my heart to their hearts in a deep and lasting way. Praying for my children reminds me they belong to God, and that I need His help everyday to be the best parent I can be. Most of all, praying shows me the generous heart of God, as He hears our cries when we look to Him humbly and expectantly for the hearts of our children. Listen to them – Confession time…Being a good listener has always been hard work for me! I’m fast-paced and task-oriented, so slowing down and pausing to hear what my kids are saying takes intentional effort and focus on my part. Sometimes, it’s just not a good time in your busy school day to drop everything and listen to your child talk; you may need to gently tell them, “I so want to hear what you have to say, but can we talk about this later, once we’re done with school?” Bedtime is often the best time to shut out the world and say “I love you” by listening to their heart. Observe them – The key to observation is taking note of what interests, excites, and motivates your kids, and conversely, what bores or troubles or frightens them. The more we take the time to observe them, the more we learn about them. That’s a big part of loving them…really knowing who they are on a very personal level. It helps us to come alongside and pray for, encourage, bless, and instruct them like no one else can. Vocalize your affection – More than saying “I love you,” this includes praising them for faithfulness, perseverance, or a job well done. It also includes telling your children what you love about the way God made them, and expressing your commitment to them regardless of the choices they make. Even using endearing words and special nicknames for your kids (I wish I had done this when they were little!) can verbally reinforce the warmth of your love for them. Enjoy them – There’s something about playing and having fun with your kids that brings your hearts together. Homeschooling can be so focused on academics, however, that you may need to schedule time regularly to laugh and play. Enjoying your kids not only means doing fun things together; it’s also working hard to appreciate the unique way God has made each of your children. For instance, you may not personally be interested in baseball, but your son hears “I love you” when you not only take him to practices and games, but also watch him play, cheer him on, empathize with his challenges, and celebrate his wins. Yearn for their success – Not just our kids’ academic or extracurricular success, but also their moral and spiritual success. Desiring for your children to be whole, complete persons who know God their Creator, who understand they need of a Savior, and who find purpose and meaning in life in the context of these truths brings a full perspective to our love for them. Overlook small offenses – Being around our children 24/7 means we see almost everything—not just the good things they do. We see the lights they leave on, the milk they spill on the floor, and the clothes scattered all over their room. We also hear the unkind words and complaining attitudes. One simple way we can love our children is to overlook their weaknesses and small sins occasionally. They don’t all need to be pointed out and corrected. This has been a BIG challenge for me! Reminding myself that God often shows me mercy helps me to seek Him for the grace to do the same for my children. Uphold the standard of God’s Word – Commensurate to showing our kids mercy, one of the most loving things we can do for our children is to give them truth. The Bible contains examples of parents who didn’t instruct or discipline their children and the consequences were severe. Equally as damaging is not pointing our children to the source of truth, the Bible. We show the sincerest love when we live under God’s Word and authority and give our children the truth that sets men free. eXpect God to do big things in your children – (besides “X” representing a kiss), expecting God to be actively at work in your children’s lives involves active love—faith in God’s power and goodness, trust in His timing and plans, praying regularly for the big and small details, working to believe that God can even use the things we try to protect our children from for good in their lives. It’s a powerful way to show our kids we love them! Open your heart wide to them – (yes, this “O” represents a hug). It also stands for a posture we naturally take with those we love. Because we love them, we expand our hearts to take in and work with everything in our kids’ lives—the good things, the challenging things, the beautiful things, the hurtful things, the exciting things, the mundane things. We don’t shrink back when they push us away in their struggle to take ownership of the faith and values we’ve been teaching them. We open up our own hearts to them and honestly express our faith, our weaknesses, our joys, and our sadness. And we run full speed toward them in the journey of this blessed life we are so very privileged to share with our children.